PortaMon - Cortech Solutions, Inc. The PortaMon is our wireless portable NIRS system, designed specifically for measurements of muscle tissue. The system measures the tissue saturation of the investigated muscle. We call this ’tissue saturation index’ (TSI). 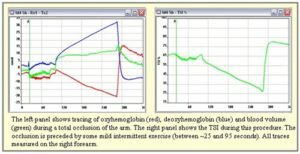 In addition to TSI, the system also measures oxygenation changes in terms of oxy-hemoglobin, deoxy-hemoglobin, and total hemoglobin, which is an indication of the blood volume in the muscle. Typical applications of the PortaMon are found in sports science, training evaluation, rehabilitation medicine, high-altitude research, compartment syndrome, occupational health and peripheral vascular disease. Note: The PortaMon is sold for research purposes only.